View of the Newport Volunteers on parade on the Isle of Wight. 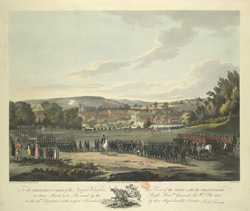 Volunteers were raised across the country in answer to a call from the King for volunteers to defend their country in case of invasion by Napoleon. Richard Livesay, portrait and landscape artist, was a pupil of Benjamin West. In 1796 he was appointed drawing-master to the Royal Naval College and moved to Portsea, from where he published his set of Isle of Wight Volunteer Reviews.